Diese Eigenschaft ist wie Ihre eigene, private Ferienanlage. Einige Sommerdaten verfügbar! Sie werden diese Eigenschaft lieben! Die Master Suite im Erdgeschoss verfügt über ein Kingsize-Bett. Bad verfügt über Whirlpool-Badewanne und Dusche. Im Obergeschoss befinden sich 2 Schlafzimmer mit je einem Queensize-Bett. (ein Schlafzimmer hat auch zwei Etagenbetten) Etagenbett verfügt über ein Doppelbett über ein Etagenbett. Bad im Obergeschoss verfügt über eine Badewanne mit Dusche und eine freistehende Dusche. Im Wohnzimmer gibt es Queen-Betten. Das Haus verfügt über eine voll ausgestattete Küche, einen Essbereich (8 Sitzplätze) und eine große Waschmaschine / Trockner. Großbildfernseher in LR & TV in jedem Schlafzimmer. Das erste Schlafzimmer verfügt über 1 Queensize-Bett und das zweite Schlafzimmer bietet 2 Queensize-Betten. Das Wohnzimmer verfügt über 2 Queensize-Schlafsofas und eine eigene voll ausgestattete Küche, einen Essbereich (10 Sitzplätze). Die Badezimmer verfügen jeweils über eine begehbare Dusche , Großbildfernseher mit VCR / DVD in LR & TV in jedem Schlafzimmer und abgeschirmter Veranda. Im Außenbereich finden Sie die Wet-Bar am Pool mit Kühlschrank / Kegerator., Abgeschirmte Veranda und weitläufige Decks & Patios mit Tonnen von Stühlen, Tischen und Sonnenschirmen zum Faulenzen und Entspannen in und außerhalb der Sonne. ++++ Preise können sich ändern. Diese Eigenschaft ist ruhig und privat., Komplett gedeckt / eingezäunt, groß mit großen Outdoor-Wohnbereichen, ausreichend Parkplätze, aber ist nur 2 Blocks vom Strand entfernt in einer ruhigen Sackgasse. This house was amazing and the owners were great. Despite the weather and a few problems along the way, my family had an amazing time. Our group was quite large and we fit comfortably in this space. There was enough room for all of us to have our quiet time. Our ages ranged from 20 months old to 65 years of age. I would definitely recommend this space for large get togethers. We ended up with storms while we were there and the pool was perfect because we couldn't get in the ocean. I lived our vacation!!!! Wonderful place for large family vacation.!! Our family had such a great time in your home. Our family of 14 had plenty of places to sleep,and the extra house the families with small children had there own little house. The short walk to the beach was a plus. The outside grill and bar area was wonderful where we could sit around the pool and enjoy our kids playing . Thank you again for letting us use your home , will difffently come back ! The family raved about the house I selected for our summer vacation. 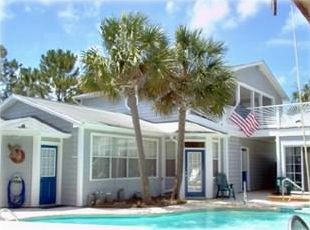 The home is two short blocks to the beach access down a quiet residential street with very little traffic. There is plenty of parking around the beach access to send a support vehicle with the beach goers. The house is on a very quiet lane with plenty of parking for four/five cars. The house is well equipped and stocked. The highlight of the rental is the pool/bar area-- We spent all of our non-beach time around the tables visiting and eating our meals. Close to several good restaurants, supermarket and a great seafood market (Buddy's on Hwy79), the house was nearly perfect. Karen was very prompt in responding to emails/text messages and returning our deposit. We had an issue with one of the AC units and the repairman was there the next morning. The house was very tidy and clean- I wouldn't hesitate to rent again- Thank you, Karen for a great stay! Thanks for a great home away from home. Beautiful home, lots of room for everyone. The pool was a big hit with everyone. The outdoor kitchen/grilling area worked very well for big dinners and we all could sit together. Great location, just a short walk to the beach. Would recommend this house to everyone. This place was PERFECT for us!!! Everyone had a place to sleep, the main house front room was plenty big enough for the main event. The OUTSIDE was the real surprise!!! The whole family loved the pool and spent most of our time there. Thank you helping us make our Momma so happy!!! GREAT PLACE TO STAY WITH A LARGE GROUP. BEACH IS WALKING DISTANCE.